The Old High Church was the regimental church of the former Cameron Highlanders Regiment. The Church houses their colours, various memorials, and rolls of honour (memorial books). We are planning to bring together various memorials of the Cameron Highlanders into a new space within the Church. This Memorial Area will be located along the wall nearest the river. The centrepiece will be the Martinpuich Cross, which will be relocated from the west stairwell. The Cameron Highlanders’ roll of honour books, war memorial plaques and other historic artefacts from around the church will also be moved to the area. exhibition space and an informal gathering place within the church. Plans are now on display within the Old High (currently open 10am to 12 noon most weekdays), and in the transept of St Stephen’s. It is hoped that the work can be completed by 18 August, when the Cameron Highlanders Association- who have raised funds for the memorials space- will join us at Sunday worship during the weekend of their annual gathering. 2013 marks the 220th Anniversary of the raising of the 79th Regiment or Cameron Volunteers by Major Allan Cameron of Erracht. You can also see the plans online by clicking the graphic above. You can make comments or ask questions using the comments box below. The following information has been provided by Angus Fairrie of the Cameron Highlanders Association, whose members have raised the funds for this project. Under the Army Reforms of 1881 the County of Inverness formed the major part of the Regimental District of The Queen’s Own Cameron Highlanders, while the Regimental Depot and Headquarters were established at Cameron Barracks. There was no church in the barracks, and so the Old High Church in Inverness became the Regimental Church of the Cameron Highlanders. During World War I the Cameron Highlanders expanded to fourteen battalions. At the end of the Great War the Service battalions of the New Army were each presented with a King’s Colour to mark their war service. When these battalions were disbanded, the King’s Colours of the 6th and 7th Service Battalions of the Cameron Highlanders were laid up in the Old High Church. After the Depot of the Cameron Highlanders closed in 1960, the Colours of the 3rd Militia Battalion of the Cameron Highlanders, which had been used by the Depot, were also laid up in the Old High Church. They have recently been restored and re-hung. Other interesting items relating to the Cameron Highlanders include the Celtic Cross erected by the 6th Service Battalion during the Battle of the Somme when it had played a distinguished part in the attack on the village of Martinpuich. 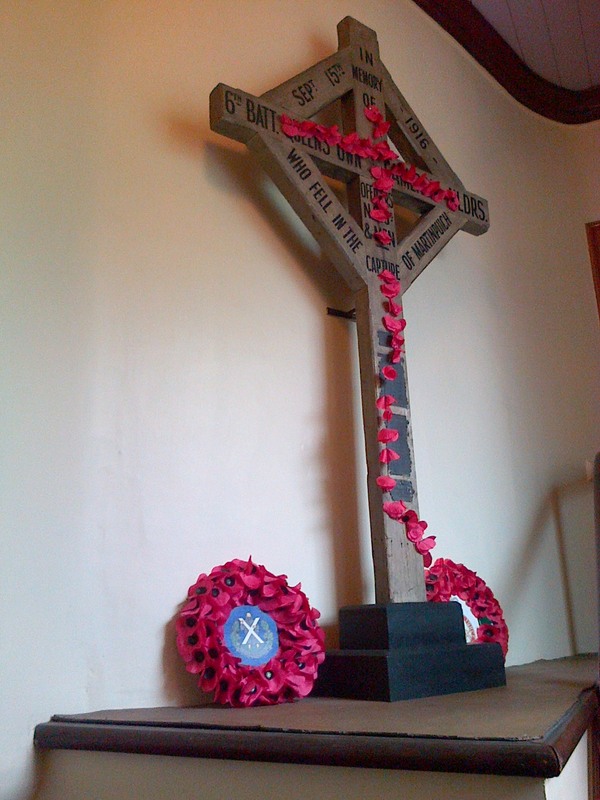 The Cross, to which the names of those killed were attached on metal tags, was recovered at the end of the war and brought back to the Old High Church. The Rolls of Honour of the Cameron Highlanders, which are copies of those in the Scottish National War Memorial in Edinburgh Castle, are also displayed. Other memorial plaques from the Depot were presented after the amalgamation of the Cameron Highlanders with the Seaforth Highlanders in 1961 to form the Queen’s Own Highlanders (Seaforth and Camerons). The present Minister and congregation of Old High St Stephen’s have decided that the Colours of the Cameron Highlanders, and the other items, should be brought together to form a fitting memorial to those who have given their lives in the service of their country and their Regiment in both World Wars, and in other conflicts.